Climb the 220 steps to the top of the majestic, red brick lighthouse. First lit on December 1, 1875, the beacon filled the remaining “dark spot” on the North Carolina coast between Cape Henry and Bodie Island lighthouses. It is one of the only lighthouses in America that still houses its original first-order Fresnel lens. The light continues to flash today at 20-second intervals, serving as a navigational aid. The beacon, which can be seen for 18 nautical miles, comes on at dusk and ceases at dawn. 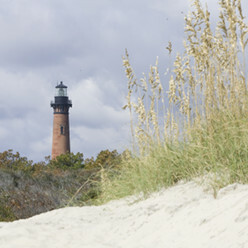 The Currituck Beach Lighthouse is a member of Historic Corolla and the Historic Albemarle Tour. The admission cost to climb the lighthouse is $10.00 for anyone 8 years of age or older, youth 7 and under are admitted free of charge with an adult (cash and checks only). Children 12 and younger may climb only if accompanied by an adult. Parents or guardians must sign a waiver for unaccompanied climbers ages 13-17. The Currituck Beach Lighthouse is open to the public mid-March through December 1st every year. During periods of high winds or extreme weather the outside gallery or the entire lighthouse tower may be closed to climbers. Take an Interactive Panoramic Tour!